COLUMBIA, Mo. –Approximately one in six veterans struggles with substance abuse, and 20 percent show signs of mental health issues or cognitive impairments, previous research has shown. These risk factors, combined with a lack of resources, could be contributing to an increase of veterans entering the criminal justice system, according to a report by the Center for Mental Health Services. Now, University of Missouri researchers have investigated ways social workers can address veterans’ needs and keep them out of jail. “Social workers are equipped to provide support to veterans through research, education, outreach and advocacy, which allows social workers to connect veterans with helpful resources rather than criminalizing them,” said Kelli Canada, assistant professor at the MU School of Social Work. According to Canada, social workers play key roles in veteran treatment courts that operate much like existing drug treatment and mental health courts, in which interdisciplinary teams address substance use, mental health concerns and legal issues. Rather than serving jail sentences for non-violent crimes, veterans are connected with teams that include social workers who are trained to assess individuals’ needs in the context of diverse environments. The social workers then work with veterans to develop multifaceted treatment plans tailored to their individual needs. 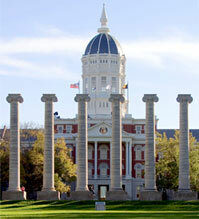 MU offers a military social work graduate certificate through the School of Social Work, which is housed in the College of Human Environmental Sciences. The certificate teaches strategies for working with military personnel and families and is available to graduate students and current social work practitioners with both online and on-campus options. The School of Social Work also houses the Center for Education and Research for Veterans and Military Families (CERV), which provides training to a variety of professionals on topics that address the particular needs of veterans and their families. Both the certificate and CERV are coordinated by David Albright, an assistant professor of social work at MU. “Social workers are often unaware of the many ways they can help veterans, so training centered around veterans’ issues is very important,” Canada said. The University of Missouri also provides support to veterans through the nationally-recognized MU Veterans Center, which connects military students, employees and families with resources. Also, the University recently opened the MU School of Law Veterans Clinic, which is staffed by law students and helps veterans and their families secure disability benefits. Canada’s paper, “Veterans in the criminal justice system and the role of social work,” which Albright co-authored, will be published in an upcoming issue of the Journal of Forensic Social Work. Canada’s work with veterans in the criminal justice system will continue with colleagues Albright and Clark Peters, an assistant professor in the School of Social Work and the Truman School of Public Affairs.